The New Year is just around the corner, and with it comes the arrival of after-holiday sales! Bed sheets, home décor, accessories, and clothes—there are discounts on just about anything! At Christmas Tree Market, we want to help you prepare for the holidays a year ahead. Get great trees at equally great prices with our after-holiday sale guide! With its slim shape, the Ticonderoga Pencil Artificial Christmas Tree is the go-to choice for small spaces, and its classic green color makes it perfect for all kinds of ornaments. The tree is available in 3 heights, with unlit, clear, and multi-colored lighting options. 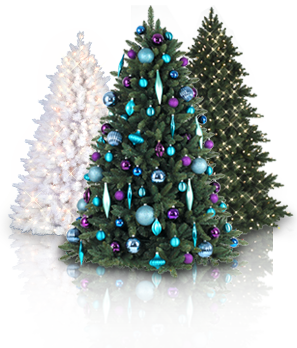 Get this sleek and elegant tree for as low as $69! Our Balsam Spruce Christmas Tree is one of our most popular and versatile artificial Christmas trees. It features a full width and gorgeous dense foliage, with sturdy branches that make it perfect for hanging your favorite ornaments. Starts at just $99 for a 4-foot tree. One of our most realistic trees, the Kennedy Fir has the perfect shape and width for small spaces. This beautiful tree is also a favorite of our brand ambassador, Jennifer Lutz! This regal tree is now available for as low as $139. Our Sophia Springs Spruce has a full width and beautifully textured branches. Its dark green hue really makes your bright and colorful ornaments pop! Get our Sophia Springs Spruce Artificial Christmas Tree for as low as $159! Our Northeastern Spruce has a combination of PVC and PE needles for a full, natural appearance. Its branches also have a spiraling pattern that spreads the needles out, making the tree a unique display for the holidays. Get this lifelike tree for as low as $159. Our ScentSicles are infused with natural oils to make your artificial Christmas tree smell just like a real one. Each cylinder contains 6 scented ornaments that last up to 30 days. Get them for only $29! Greet the New Year with a lot of savings with these after-holiday artificial Christmas tree sales! See more trees, wreaths and garlands, and other accessories on our website, www.christmastreemarket.com! Question – How are the branches attached on your slim, pencil trees? How are trees stored (sizes of boxes, etc)? Thank you so much for your inquiry. Branches are “wrapped” which means they are attached to the trunk but require the customer to pull them down to the proper position. They are not hinged. As for storage, the size of the box will be determined by the size of the tree, but the average size for a 6-7.5′ tree is 36″x10″x13″. We also have storage bags that are sold separately as another option.